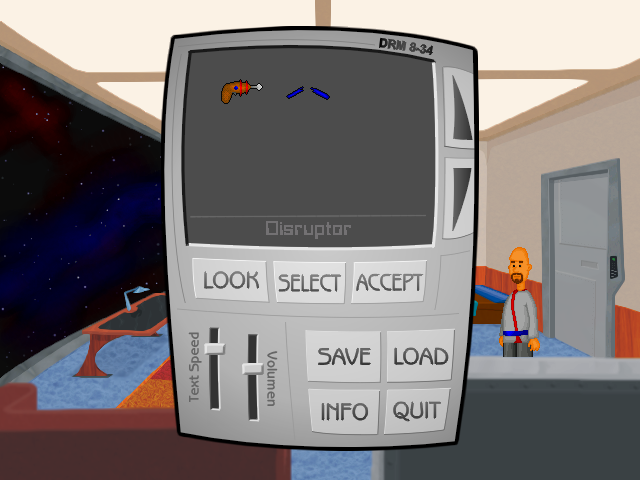 After a long sleep Trevor Daison needs your help to escape from a space station. Let the real adventure begin . . .
An intriguing game of space exploration, challenging battles and wacky plots... this is not. Well, maybe except for the wacky plot. But it's a great game, with a charismatic player character, alien technology, nice graphics, alien merchants, a sassy computer, alien rooms, regular tools and alien brochures. A must play for everyone who is planning to be alive during the XXI century. Dude, what a cliffhanger at the end... I'm looking forward for the second chapter wih more of space exploration, challenging battles and alien aliens! Great game, a must for all StarTrek fans! Definitely a future Pick of the Month, this game gets top marks all round from me. Worthy of particular mention is the interface, which is especially well done. I'm only sorry that the game is quite short. It ends on something of a cliff-hanger, though, so roll on the next episode!